Savannah is a HUGE fan of Sesame Street, especially that cute red monster, Elmo! If you follow me on Instagram, you know we had a blast when the Sesame Street POP UP TOUR: K is for Kindness came our way. I was SO EXCITED to get to take Savannah and to see her little face light up seeing her friend made my day! This was the set for the event. Elmo and Abby came out and put on a show. We weren't able to stay for the event, since Big Brother had a basketball game, but we were invited to a media pre-show to get to meet them beforehand. I know some are big fans and others aren't so much, but let me ask you something. Are you familiar with the Ronald McDonald House Charities? I have heard of it and I knew it was a great thing, I really didn't know much about it, until recently. 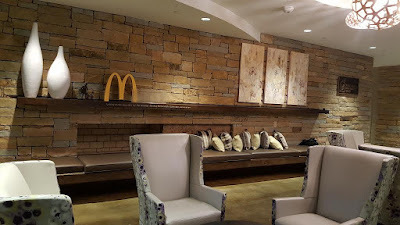 We were invited to go and tour one of the Ronald McDonald House's in Atlanta. Let me give you a brief rundown of what I learned when I visited. If you have a child, from birth to 18 (or 21, depends on the house) seeking medical treatment near a RMHC, you can fill out paperwork at the hospital to see if they have a room available. Just a super short post for you. Sorry I have not been around here lately, I promise I am coming back though. Don't worry!!! As you remember, the end of 2016 had us dealing with a sick baby off and on, so that was a big reduction on my blogging. Then, if you remember, I posted asking for Prayers for Albany once my hometown was hit by Tornadoes on January 2nd. Well, I am not sure if you know, but they were hit AGAIN on January 22nd. Yes, two times in one month... I went down there, so you will hear about that soon. For now, I just wanted to let you know that I am coming back, so please don't leave me!!! !